It’s January, and one of the things I resolved to do in the New Year was participate in Long-Awaited Reads Month. I’m sure any avid reader will agree with me – sometimes you buy a book that looks absolutely wonderful, and then for one reason or another, you don’t read it for YEARS. It sits on the shelf (or e-reader) gathering dust, and though you know it’s probably wonderful, you keep putting it off. Well, I’m finally reading a few of those books. Sharon Shinn's Jenna Starborn was up first. Shinn writes beautiful, deep, heart-wrecking books, including Archangel from the Samaria series, and Troubled Waters from the Elemental Blessings series. Jenna Starborn is a sci-fi standalone, and perhaps even more relevant to a potential reader, it’s a retelling of Charlotte Brontë’s Jane Eyre. Jenna Starborn was created out of frozen embryonic tissue, a child unloved and unwanted. Yet she has grown up with a singularly sharp mind—and a heart that warms to those she sees as less fortunate than herself. This novel takes us into Jenna Starborn's life, to a planet called Fieldstar, and to a property called Thorrastone—whose enigmatic lord will test the strength of that tender and compassionate heart. In this science fiction future, there are five levels of citizenship, and one’s place in the hierarchy determines everything (or almost everything) in life. Jenna Starborn is a half-citizen – she was commissioned, ‘grown’ in a gen tank, harvested, and then raised by a citizen, but never formally adopted by her ‘creator.’ As a half-cit, her future is precarious at best. In the beginning she must face it alone – but Jenna is quietly extraordinary, and she wins friends and family for herself. While working at Thorrastone Park on the terraformed planet of Fieldstar she finds love, but there are mysteries, complications and machinations to maneuver before the tale comes to a (satisfying) conclusion. The plot of Jenna Starborn is, of course, well-known to anyone who has read Jane Eyre, or seen the film versions (Michael Fassbender as Rochester in the latest incarnation = hello, dreamy!). When I first read Brontë’s classic in the 9th grade I mooned over it for several months – reread it and identified with it and thought it enormously romantic. I am a different person now, and I’ve had many years to consider whether or not I’d like a Mr. Rochester of my own. The answer has changed to an emphatic ‘NO.’ I can still see the romance in the tale, but I would not want to live it… and I think that knowledge kept me from sinking completely into Shinn’s web of words. Like the original Jane, Jenna is a private, quiet person. She prefers quiet environments and smart, purposeful people. She’s guided by strong moral principles and believes in justice, equality and kindness, though she knows that in practice the world around her is unfair. Unlike in the original, she’s a highly proficient nuclear technician, and she is no one’s governess. Jenna is also a member of the PanEquist belief system, and what one gathers of this religion and its adherents fits in nicely with her ideals and uprightness (and also makes for a satisfactory differentiation from the 19th century Christianity that was Jane Eyre’s faith). The most interesting part of the book, for me, was seeing the ways in which Shinn was faithful to the original tale, but still made it her own, and made it sci-fi. An unapologetically brilliant and scientific heroine is a lovely rarity in my reading life. At the same time, Jenna doesn’t discard her feminine side or lack for emotion – she feels deeply, but organizes her hopes quite strictly according to her inner moral compass. This combination adds to generally practical, rational Jenna’s humanity and empathy. She’s a character that the privileged modern reader can access. I’d say Shinn has done a marvelous job of evoking the classic in Jenna’s character. I can also tell that Jane Eyre must be a huge influence on everything Shinn writes, because it contains her standards: a heroine who knows herself, and a hero who has made (or is still making) dubious choices, even though he means well. 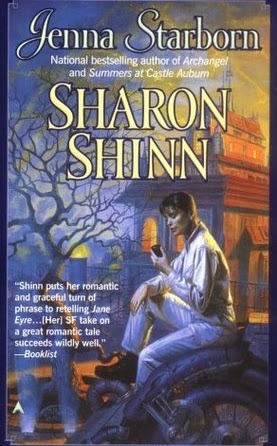 Shinn writes the most beautiful, shattering romantic moments, and though I’m not as partial to Jenna Starborn as I am to other of her works, I can’t say I escaped unscathed – I cried! Jenna Starborn is a noteworthy tribute to a classic, and at the same time a delightfully deep sci-fi romance, with wrenching emotion and difficult choices that make up real life, and the requisite happy conclusion. Recommended for: fans of Jane Eyre, and anyone looking for sci-fi, romance, or beautiful, emotion-filled writing. interesting... why are you so freaking good at reviewing books? you always make me want to read more (which isn't *always* a problem... just when i'm trying to sleep).